When it comes to Japanese literature, my comfort zone tends to be early-to-mid twentieth century (with the exception of contemporary writers such as the Murakamis). However, I’m not averse to taking the odd trip further back in time, as a quick glance at my list of J-Lit reviews will show, so I was happy to take Columbia University Press up on their offer to review the paperback edition of another classic. Today’s choice dates from the start of the 14th Century, and it poses a rather clear question – do you believe in miracles? 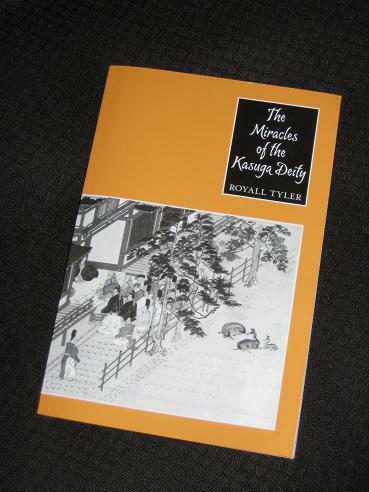 Royall Tyler is well-known for his efforts with major works in Japanese Literature (e.g. The Tale of Genji and The Tale of the Heike), and while The Miracles of the Kasuga Deity doesn’t quite match up to those in terms of length, it’s certainly up there in importance. Nara, the Imperial capital immediately before Kyōto, is home to a number of shrines and temples, and Kasuga-taisha (while now slightly overshadowed by the Tōdai-ji complex with its ‘Big Buddha’) is one of the most famous. At the foot of Mikasa-yama, surrounded by parkland (and wild deer! ), it’s a beautiful location, but, more importantly, home to some of the most important Gods in the Shinto religion. The Kasuga Deity was the tutelary deity (ujigami) of the Fujiwara, while for Kōfukuji he was not only a protector but also a source of legitimacy for the temple’s power. In the first years of the fourteenth century, this convergence of enthusiasm produced one of the major artistic achievements of the Kamakura period:the superb emakimono (“set of painted handscrolls”) entitled Kasuga Gongen genki (“The Miracles of the Kasuga Deity”). Tyler then goes on to discuss the history of the scrolls, including a painstaking record of their travels, sources and inspirations. The second half of the book moves on to the miracles (the Genki) themselves, providing a series of short sketches. Many show encounters between the Deity and his followers over the centuries preceding the creation of the scrolls, with the Daimyōjin appearing in dreams or possessing various messengers (who could be servants, high-ranking monks or even retired Emperors). The stories offer an insight into temple life and history, showing the political upheaval of the twelfth century and the frequent skirmishes between rival temples (such as when Kōfukuji monks storm off to Kyōto to do battle with monks from Mount Hiei after the burning of ‘their’ Kyomizu-dera…). On the whole, the texts are short pieces (often outdone in length by the following notes) showing the immediate effects of piety and prayers to the Kasuga Daimyōjin. One example of this is the story of Sanetsune and Lord Chisokuin, where the Lord’s illness is caused by the arrest of the pious old man. Once Sanetsune is summoned, and prayers are directed towards Kasuga, the illness vanishes. In fact, the Deity’s powers even extend beyond the grave, with several examples showing devout monks and laymen being revived after their passing. On awakening, they tell of their encounters with the King of Hell, who politely allows them to return to the land of the living when a manifestation of the Deity demands it. The Miracles of the Kasuga Deity certainly won’t be to everyone’s tastes. I’ve dabbled in the area of classical Japanese writing before, and certain names were familiar (especially the Taira connections provided by The Tale of the Heike), but I was lost at times in the religious doctrine and copious footnotes, and I suspect that a novice (no pun intended) would struggle to make headway through the intricacies of Buddhist prayers. Still, it’s a fascinating journey into the past, particularly if you’ve ever visited the region where it all takes place. During my time in Japan, I stayed in Nara twice, and while Tōdai-ji is now the main draw, I did visit both Kasuga-taisha and Kōfuku-ji (or what is left of it…), even if I was unaware of their significance at the time. What I love about Nara is that this area of the city has been left untouched by modern urban sprawl, with the contemporary centre situated to the west, away from the ancient capital – the deer still roam the Kasuga precincts, and the giant Torii gates still stand on the boundary between Kasuga and the Kōfuku-ji complex.